I started messing with my Animata OSC plugin for Quartz Composer and trying out different kinds of data I could feed from QC to Animata. The Audio Input patch is the obvious choice, so might as well get that over with first. The first test. Just playing various samples and seeing how the communication works. Not very exciting, since I’m not using any images in Animata. Click here to download the Quartz composition and the Animata file I used in the video above. The only special thing worth noting in the .qtz is that I’m normalizing the bands a little bit and scaling the values. Otherwise the 0-band would always peak out and the others wouldn’t really output anything useful. Requires the Animata OSC plugin for Quartz Composer. I will probably post something more interesting tomorrow. The point with this test was more to do something I’ve been meaning to do for a long time. 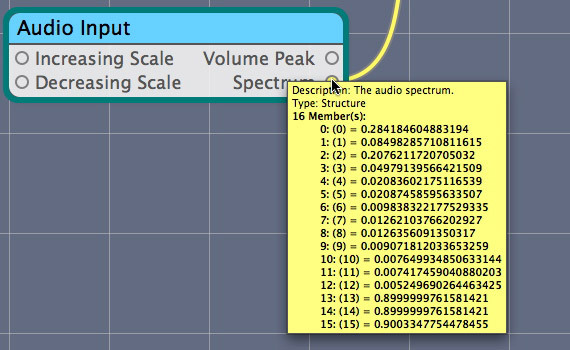 That is to figure out exactly what is the frequency range of the different spectrum bands of the Audio Input patch. There was no point trying to measure Bands 13-15 since they go over 20kHz and my sound card can’t handle that. Actually, in normal use – normal use for me meaning music visualizations – there’s not much point using the bands above 8, since the amplitude at those frequencies is barely noticeable. Let me know if you are doing something cool with Quartz Composer and Animata. This entry was posted on Sunday, July 12th, 2009 at 0:57	and is filed under Animation, Programming, Tutorial, Video/VJ. You can follow any responses to this entry through the RSS 2.0 feed. You can leave a response, or trackback from your own site.